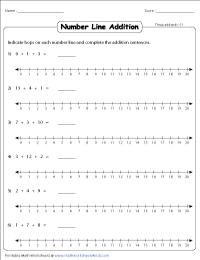 Grab this entire ensemble of number line worksheets to help young learners grasp the concept of addition. 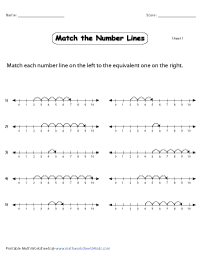 An array of interesting worksheets include exercises like read the number lines, draw hops on the number lines, find the missing numbers, frame addition sentences, a variety of MCQs and much more! Based on the addends, the worksheets have been categorized into 0 to 5, 0 to 10 and 0 to 20 number lines which enables an easy download environment. 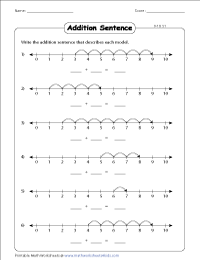 Read each number line and complete the addition equation in this series of worksheets. The worksheets are classified into two levels based on the addends. Use the first addend as the starting point in the worksheet. 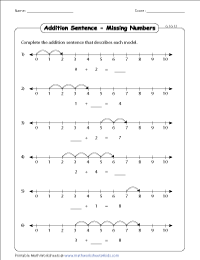 Indicate hops on the number line and complete the addition sentences in this array of worksheets. 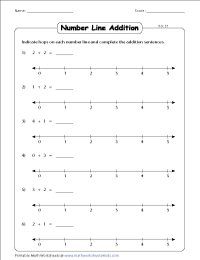 Observe the hops indicated on the number lines to identify the missing addend or sum in this batch of worksheets split in two levels to facilitate easy learning. Use the answer key to check your responses. Frame the correct addition sentence to match the hops indicated on each number line. These worksheets are segregated based on the range of the addends. 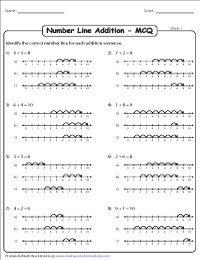 This eclectic mix of worksheets features both vertical and horizontal addition. 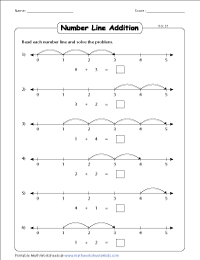 Use the number lines to solve problems in this series of addition worksheets. 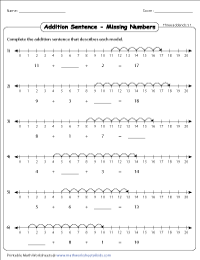 Use your analytical skills to identify the correct addition sentence that matches each of the 0 to 10 number lines provided in this batch of worksheets. Observe each addition equation and identify the number line (with hops) that best matches them. Employ this set of MCQ worksheets to improve your logical skills. Pair the number lines on the left to the equivalent number lines on the right. Use the download option to access this entire set of worksheets. Draw hops on each number line to show the sum of three addends. Solve the addition problems. 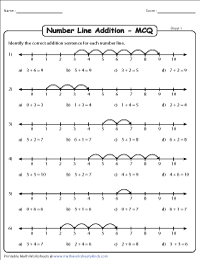 Identify the missing addends or the sum based on the hops indicated on the number line. 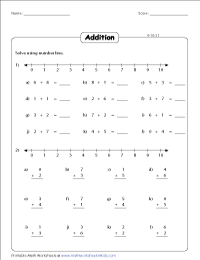 This batch of worksheets helps reinforce your child's addition skills involving three addends.